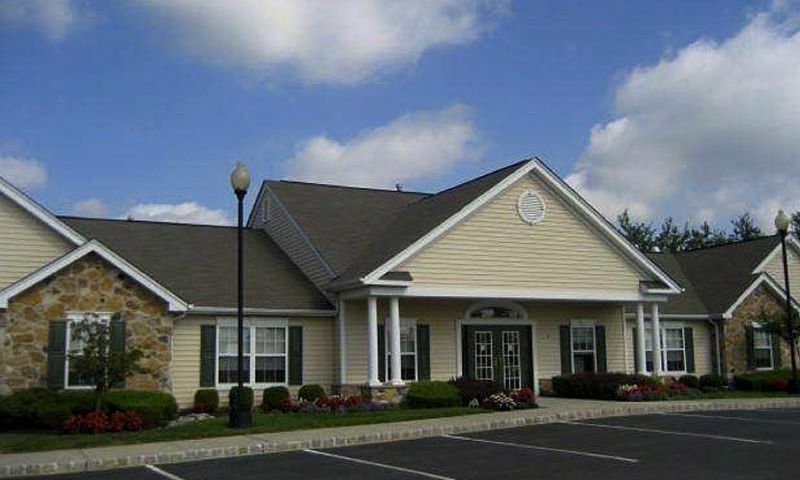 Situated in Sewell, New Jersey, Parke Place is a 55+ community in Gloucester County. This ideal location offers easy access to popular destinations such as New York City and Philadelphia. In addition, there is shopping, dining, entertainment, medical facilities and much more within minutes of the community. This 55 and better community contains of just over 400 residences. With both condominiums and single-family homes, homebuyers are sure to find the perfect home that fits their needs. To top off this wonderful community, the welcoming clubhouse will entertain your whims and invite your arrival. The charming clubhouse located within Parke Place is the perfect place for social and recreational activities. Homeowners can work out in the fitness center or join neighbors in a game of cards or billiards. The amenities continue outdoors with a sparkling pool and patio. Those who like to stay active will enjoy the tennis and bocce ball courts. Getting in touch with nature is easy with the walking and biking trails that are found throughout the community. Built between 1999 and 2003, Parke Place contains just over 400 age-restricted homes. Home styles range from low-maintenance condominiums to beautiful single-family homes. There is sure to be a home style, size and price range to match the needs and budget of almost any active adult buyer. The condo units are located in two-story buildings and range in size from 1,353 to 1,436 square feet. These homes have two bedrooms and two bathrooms with lot parking. These low-maintenance residences have open floor plans and a patio or balcony. There were a handful of single-family models offered that range from 1,308 to 2,268 square feet of living space. These homes feature two to three bedrooms, two to three bathrooms and an attached one or two-car garage. Some homes also have a den, eat-in kitchen, sunroom and back patio. Residents appreciate the carefree lifestyle offered within the community with lawn maintenance and snow removal taken care of by the association. Instead of having to worry about tedious outdoor chores, residents now have more time to enjoy all of the fun events and activities that take place throughout Parke Place like games of cards, billiards, tennis, and bocce ball. Parke Place features many amenities to keep its residents happy, healthy and busy. Parke Place is located off of Delsea Drive on Parke Place Boulevard in Sewell, New Jersey. Residents are within walking distance to Bethel Mills Park which offers many sports courts and walking trails. Just outside of the community residents can enjoy shops, restaurants and recreational facilities such as Parke Bank, Pizza Italia, Margaret E. Heggan Library, and many other retail stores. With major highways close by such as Interstate 295, Interstate 76, and Interstate 95 traveling is made easy. Residents can enjoy all that Philadelphia has to offer with a short 25-minute drive and New York is also less than two hours away. With entertainment both near and far it is easy to see why Parke Place in Gloucester County, New Jersey is the ideal active adult community. There are plenty of activities available in Parke Place. Here is a sample of some of the clubs, activities and classes offered here. The condo units are located in two-story buildings and range in size from 1,353 to 1,436 square feet. These homes have two bedrooms, two bathrooms, and there is also lot parking. These low-maintenance residences have open floor plans and a patio or balcony. Please Note: Floor plans are not available at this time. There are a handful of single-family models offered within Parke Place that range from 1,308 to 2,268 square feet of living space. These homes feature two to three bedrooms, two to three bathrooms and an attached one or two-car garage. Some homes also have a den, eat-in kitchen, sunroom and back patio. Please Note: Floor plans are not available at this time. I bought a home here last summer and really debated between a condo or detached home. I ended up deciding on the detached home and am very happy with it. In my home shopping I felt the condo units weren't as well kept as the homes. There isn't much maintenance and what I can't do myself I hire out. The neighbors have been very nice and I feel right at home here. 55places.com is not affiliated with the developer(s) or homeowners association of Parke Place. The information you submit is distributed to a 55places.com Partner Agent, who is a licensed real estate agent. The information regarding Parke Place has not been verified or approved by the developer or homeowners association. Please verify all information prior to purchasing. 55places.com is not responsible for any errors regarding the information displayed on this website.